The Royal Residence of the Royal Palace (also known as the Palace on the Dam) is no longer in use. The public can visit the palace. A day out in Amsterdam and a visit to the Palace on the Dam complement each other perfectly. You can come by car: parking in the city centre is easier and cheaper than you might think. Parking Centrum Oosterdok is the smartest place from which to start a day (or evening) out in Amsterdam city centre. Parking Centrum Oosterdok is located right alongside Amsterdam Central Station and is therefore the ideal base for a visit to Amsterdam. Ours is also the cheapest place to park in the centre of the city: for a full day’s parking (24 hours) you pay just € 20. Parking Centrum Oosterdok parking rates. The Palace on the Dam is currently no longer in use and is open for the public to visit. The palace was originally built as the City Hall and came into use in the summer of 1655. It was first used as a palace two centuries later, by Willem V. In 1936, the palace was officially declared a national monument. 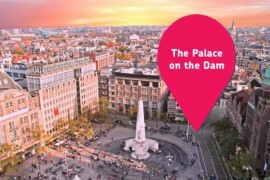 The Palace on the Dam is definitely worth a visit. More information on the Palace on the Dam.